The July 9 New Yorker had a "Talk of the Town" entry about birdnappings in New York City. People are suddenly netting pigeons by the dozens and carrying them off, and no one seems to know why. But I have a theory. Tonight, to celebrate our wedding anniversary (also the 39th anniversary of our first date!) Russ and I went to see The Bourne Ultimatum. 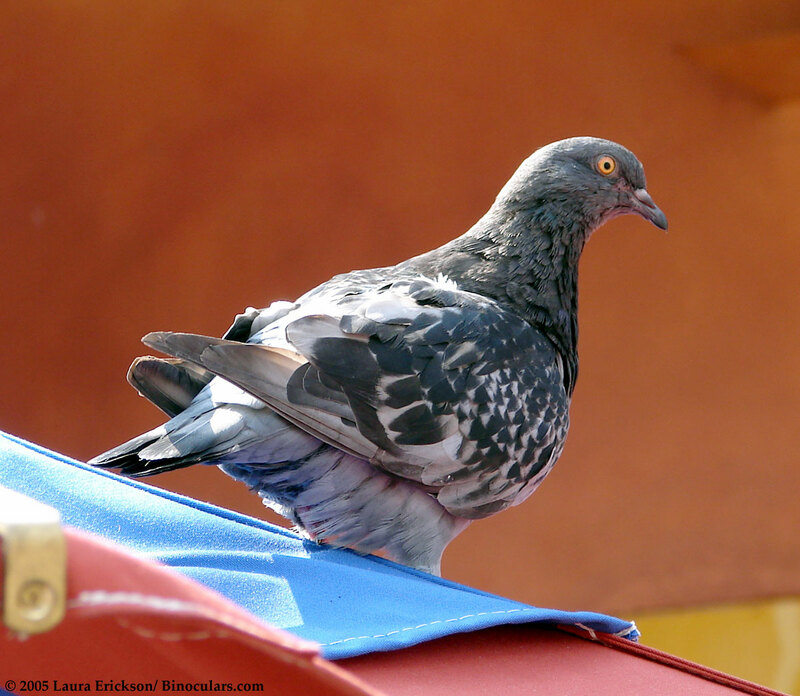 I noticed only a single scene with pigeons (I suppose I'll have to watch it again to see if I missed any others)--when a car was careering down a narrow alley in Paris, a pigeon flew through. But I noticed in the credits for the Paris unit a credit for both a "Pigeon Wrangler" and a "Pigeon Handler." Maybe these pigeons are being lured away to star in movies. 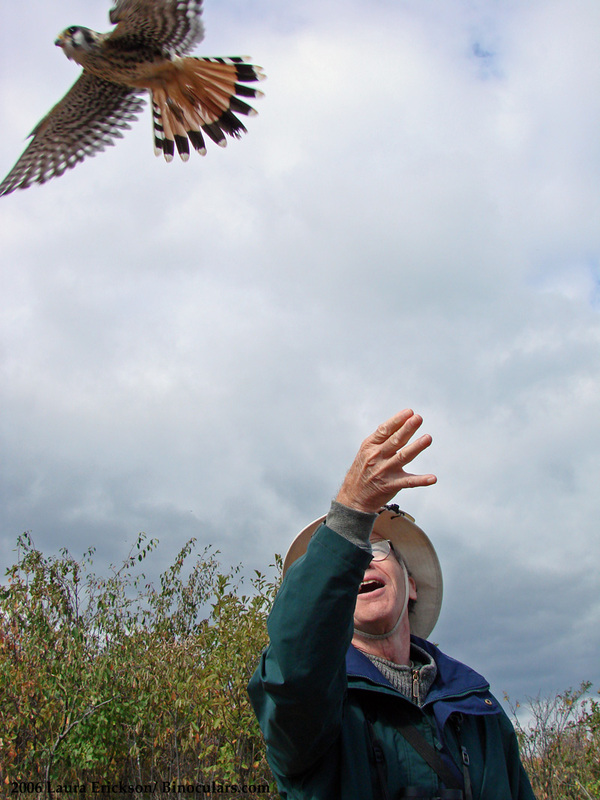 Tomorrow (Friday, August 31) I'll be serving as the emergency auxiliary backup counter at Hawk Ridge Bird Observatory. We'll have two new counters this year--one is from Veracruz and has witnessed and tallied some HUGE counts! She'll be starting on Saturday. 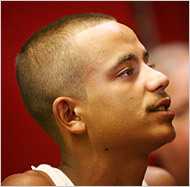 And Karl Bardon, the other counter, has to go pick her up in the Twin Cities. So I'll be filling in for the day. It's hard to predict what the migration will be like. Good days in August are quite small compared to good days in September, but we usually have Osprey, American Kestrels, and Sharp-shinned Hawks. If a Mississippi Kite happens to wing by, it virtually always happens at the end of August. So stop on by and say hello! And if you can't make it tomorrow, things are only going to get better and better there in the coming days and weeks! Today's For the Birds is about how migratory birds easily put on fat and then burn it up. Too bad we can't just flap our arms and lose weight at the same rate! 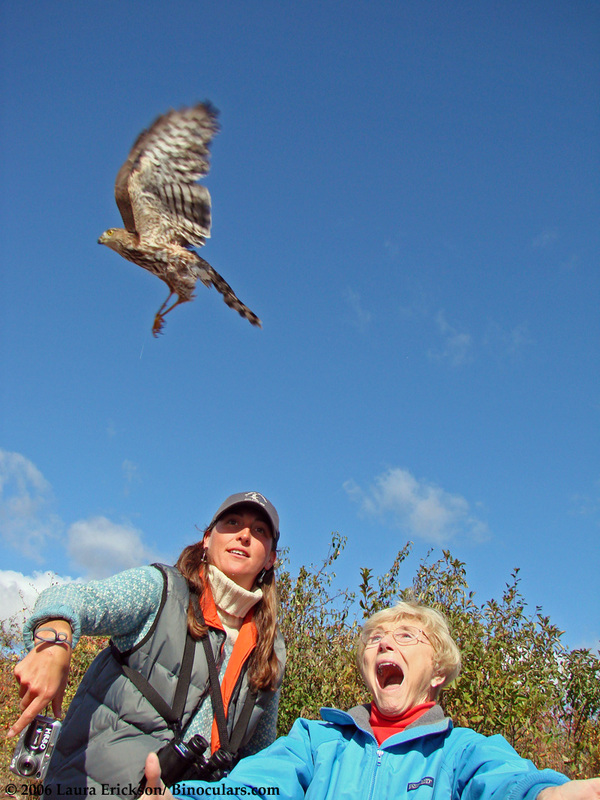 2) If you use iTunes, open the iTunes store, search for "Laura Erickson For the Birds" and subscribe there. If you subscribe via iTunes, the podcasts include the script (on the iTunes lyrics page) and have a photo, usually of the bird the program is about. Audubon At Home: New resource! The splendid Audubon At Home has developed a new resource with ideas for helping individual species. Check out Birds to Help! I contributed some of the information for this resource. The program will be tweaked in the coming weeks, and after any problems get ironed out, new species information will be added little by little. 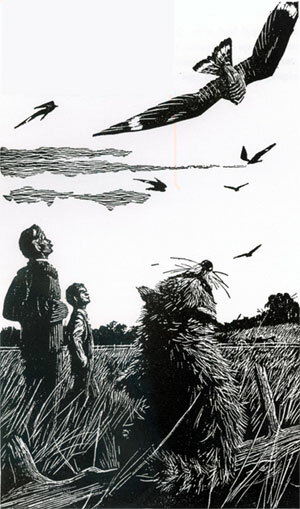 Woodcut from Rascal by the wonderful artist John Schoenherr, who gave me permission to use this, my all-time favorite nighthawk illustration. This week I got busy with a project that required me to head out to two different hardware stores. On August 27, I was in the parking lot of Dougherty’s when I looked up to see hundreds of nighthawks passing over. The next day I was walking to Marshall Hardware in my neighborhood and there the nighthawks were again, streaming to the southwest, as always following the general direction of the shoreline. Even when nighthawks are on a migratory mission, they’re constitutionally incapable of flying in a straight line. A distance of five miles as the crow flies would be more like eight or nine miles as the nighthawk flies. They dart and weave through the skies like narrow-winged butterflies. In that respect, they’re a living example of the precept that you are what you eat, since butterflies, moths, and other flying bugs are the only things these obligate insectivores can eat. Nighthawks are so specialized at downing insects on the wing that they can’t eat anything else. Their capacious gape comes at the expense of a reduced, loosely-attached beak that can’t pinch or grab, and a reduced tongue so tiny that it can’t help the process of swallowing. Nighthawks aim at their prey with their mouth open wide, hitting them at about 5.3 meters per second, or 11 miles per hour—fast enough that the bugs go down the hatch without the nighthawks even needing to use any muscles to swallow. When I rehabbed nighthawks and kept a nighthawk licensed for education, I noted that adult males weren’t even capable of swallowing for days or weeks—when I placed food in their mouths, I had to stroke the throat to help the food go down. The nighthawks I was watching winging over the parking lots weren’t in need of a rehabber—they were darting about in the skies, grabbing food as they traveled. They have a long way to go—they’re headed for Texas, and then they’ll go down Mexico way. Virtually all of them will funnel down through Central America, cross the Panama Canal, and not park themselves until they reach South America. Their winter range isn’t well understood, but there’s some evidence that it centers around Uruguay and Paraguay. Nighthawks reach north country later than most migrants and leave earlier—their first flights begin in July, and peak sometime in mid to late August. Mike Hendrickson counted 43,690 in 2 ½ hours on August 26, 1990. We haven’t had flights that huge in over a decade—a host of data from throughout North America indicates that nighthawks have significantly declined since the 1960s. We humans have managed to have bad impacts on nighthawk food and habitat, and our automobiles and powerlines have a literal impact on them. 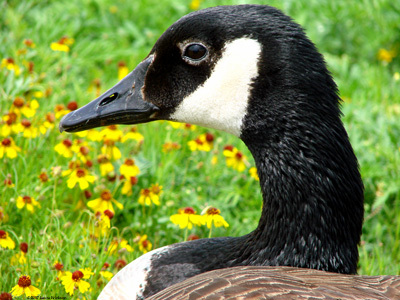 These birds are completely inoffensive, eating insect pests and causing no trouble at all. I’ve known many individual nighthawks from my rehabbing days, and they’re universally gentle spirited birds—the Mr. Rogers of the bird world. It’s depressing to think of how the former huge numbers of nighthawks have dwindled, but pessimism doesn’t help us or nighthawks. When I look up on a lovely afternoon and see hundreds flying over, an unexpected and lovely gift from the earth, winging its way into my heart through the skies, I feel a wave of joy and gratitude. And really, the joy and gratitude any of us feel when we see a natural wonder is one of the few hopes nighthawks and other precious but inconspicuous creatures have. As Dr. Seuss wrote, Unless someone like you cares a whole awful lot, nothing is going to get better. It's not. So pay attention to the afternoon skies, and if you see a group of nighthawks, wherever you are, let the sight lighten your heart. It’s lovely to work to help something not out of fear, but out of joy and gratitude for the gift of sharing our little planet with such a gentle and beautiful treasure. I've been trying to catch up with podcasting "For the Birds." 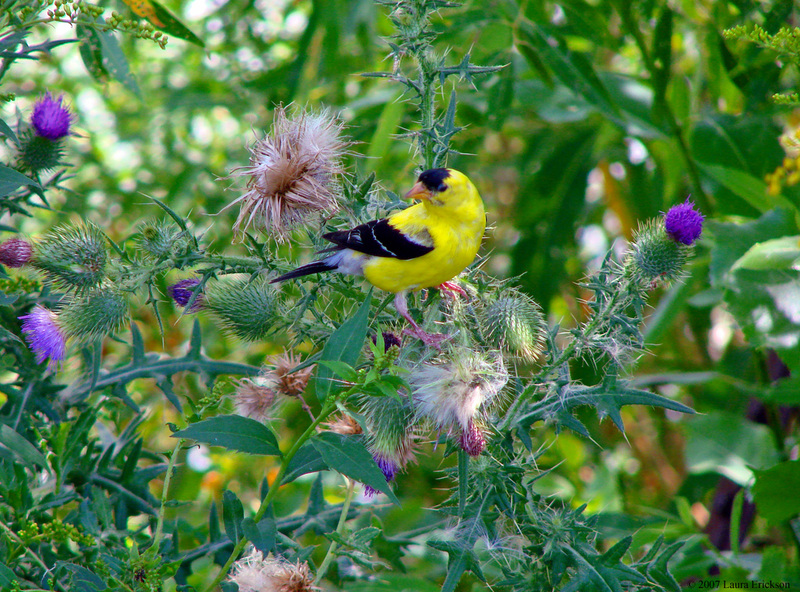 You can listen to this and other programs at Laura Erickson's "For the Birds." I just found out that when people google "Laura Erickson Blog," a commercial website is the number one result. If you have time, please google "Laura Erickson Blog" and then click on my actual blog. Thanks!! I discovered this week on a forum of well-educated people, mostly liberals like me, that a great many people don't realize that a LOT of electricity used in this country is generated by burning coal. And today the Bush administration is set to allow companies with a profit motive to start taking ever more coal from the earth via mountaintop mining. This is destroying habitat for a badly declining species, the Cerulean Warbler, but an administration that thinks so little of preserving habitat for a treasured game species such as the Sage Grouse is hardly going to be worried about a third-of-an-ounce songbird that hardly anyone has ever heard about, despite its great beauty. Read today's New York Times article, Rule to Expand Mountaintop Coal Mining. 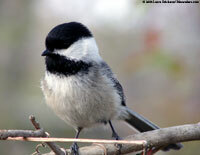 I discuss how energy is generated and the implications for birds in 101 Ways to Help Birds. It's been well-reviewed but other than a handful of people, hardly anyone mentions the book in any discussions of energy and water conservation, recycling, trying to eat lower on the food chain and selecting as many groceries grown close to home as possible, or other issues that are getting a lot of attention right now, even though all of them have implications for birds and so were covered, some in a lot of depth, in the book. It's available in public libraries and may be worth your time to check it out. Right this moment, I'm looking at weather.com on my computer, and seeing the image of a Category 5 hurricane just hitting the eastern coast of the Yucatan Peninsula, as I listen to the sounds of a few hummingbirds out my window. The Yucatan is where a lot of human beings live, and where some take vacations. 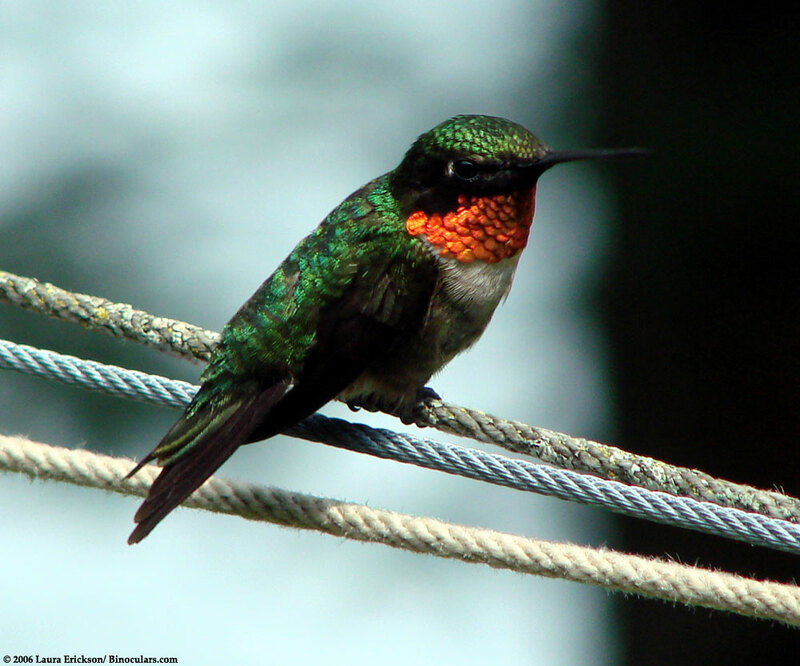 It's also where virtually all our Ruby-throated Hummingbirds spend the winter. Right now some adult males are already there, some may be striking out on the Gulf coast headed for there, and all the ones still in our backyards are headed in that general direction. The storm will undoubtedly kill some--anything that can rip apart a house isn't going to be very gentle to a bird that weighs one tenth of an ounce. Of course, birds can feel, literally in their bones but also in all their air sacs, the low barometric pressure associated with hurricanes, and except for exhausted birds flying over the Gulf, many will be able to stay ahead of the storm, which is only traveling 20 miles per hour right now, while hummingbirds have little trouble sustaining 30 mile per hour flight. So not all that many will be outright killed by the storm. But as with all tremendous storms, this one will destroy habitat. 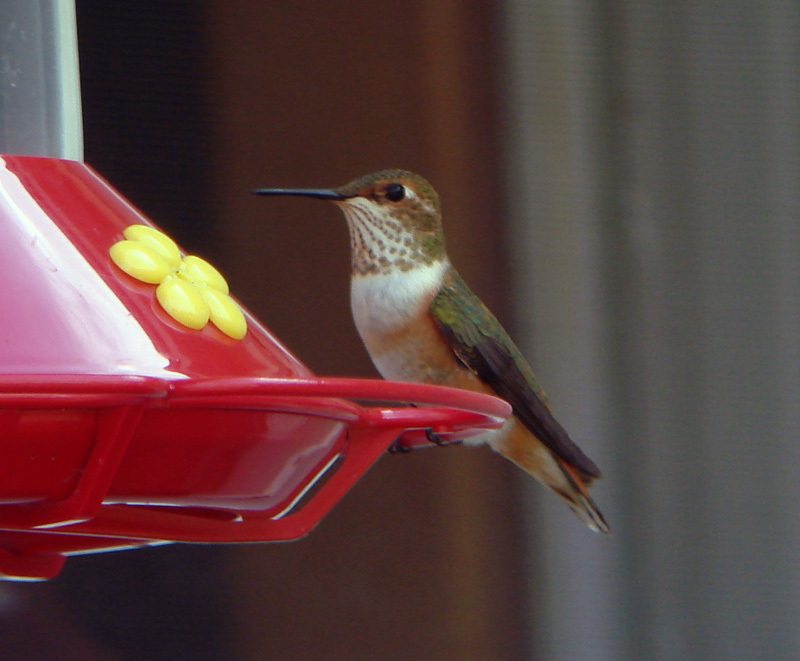 Of course plants that hummingbirds depend on for food and shelter are being destroyed even as I type this. Also, when storms hit cities, lots of pollution enters the scene--from flooded automobiles and trucks, broken tanks filled with propane, gas, oil, and other toxins, etc. The hurricane is already weakening over land--at this moment it's been downgraded to a Category 3. But once it gets back to the southern Bay of Campeche, it's expected to strengthen all over again before it hits land again in Veracruz. It's exhausting keeping up with dangerous hurricanes, and people tend to adjust to an then to start filtering out bad news. Birds are going to be a minor concern in the face of human beings needing assistance. I'm not sure what we can do to help either from so far away--I feel pretty insignificant and helpless right now. But if anyone has suggestions, please post comments. I can't wait! Amazon has a listing for Disapproving Rabbits, the Birdchick's (Sharon Stiteler) new book! Are hunters capable of compassion? When food is scarce, a mother hawk or owl will sit by placidly as her bigger young kill and eat the smallest. Life or death are the alternatives, and the tiniest body may well provide the nourishment her larger ones need to stave off their own deaths. Yet that same mother, in the face of her own hunger, feeds and preens her tiniest, weakest babies with a tenderness that mirrors the gentlest, most nurturing human mothers. Birder's World's Chuck Hagner, recently back from the AOU meeting in Laramie, Wyoming, where he attended Geoff Hill's paper regarding the status of the Ivory-billed Woodpecker search in Florida, has an insightful, clear, and fair report of both Geoff's presentation and the paper published in this week's Science: Science, the Ivory-bill, and the vortex of extinction. Check it out. Section 1. Purpose. 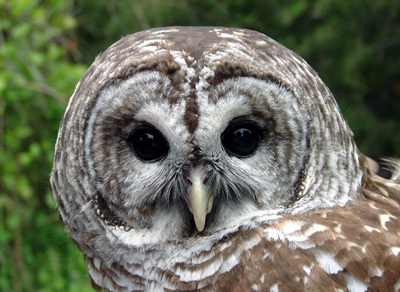 The purpose of this order is to direct Federal agencies that have programs and activities that have a measurable effect on public land management, outdoor recreation, and wildlife management, including the Department of the Interior and the Department of Agriculture, to facilitate the expansion and enhancement of hunting opportunities and the management of game species and their habitat. Among other actions that drew the ire of wildlife biologists and lawyers, Ms. MacDonald had heavily edited biologists' reports on sage grouse, a species that in the end was not placed on the threatened or endangered lists. 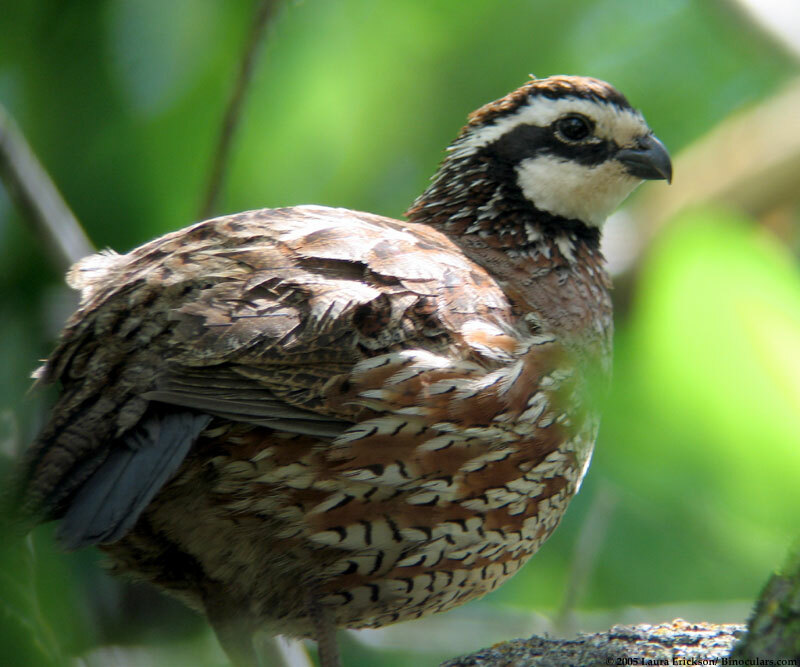 Their habitat overlaps with vast parts of the Rocky Mountain West, where oil and gas drilling and cattle ranching are prevalent; listing the grouse as endangered or threatened could have curbed those industries' access to federal lands. 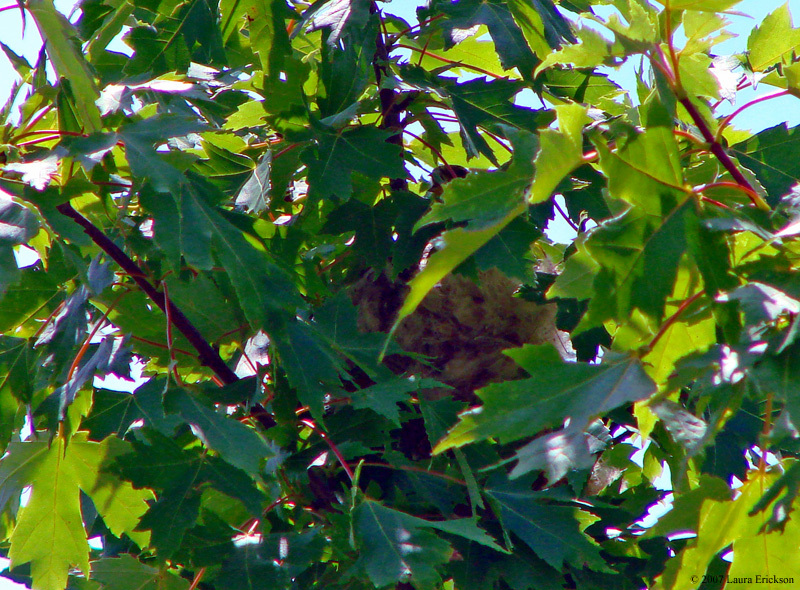 In another case in the inspector general's report, Ms. MacDonald demanded that scientists reduce the nesting range for the Southwest willow flycatcher to a radius of 1.8 miles, from a 2.1-miles, so it would not cross into California, where her husband has a ranch. She also gave internal agency documents to industry lawyers and a lawyer from the Pacific Legal Foundation, all of whom frequently filed suit against the Interior Department over endangered species decisions. Can things be worse than that? If we learned that Al Qaeda was secretly developing a new terrorist technique that could disrupt water supplies around the globe, force tens of millions from their homes and potentially endanger our entire planet, we would be aroused into a frenzy and deploy every possible asset to neutralize the threat. Yet that is precisely the threat that we’re creating ourselves, with our greenhouse gases. While there is still much uncertainty about the severity of the consequences, a series of new studies indicate that we’re cooking our favorite planet more quickly than experts had expected. Critics scoff that the scientific debate is continuing, that the consequences are uncertain — and they’re right. There is natural variability and lots of uncertainty, especially about the magnitude and timing of climate change. In the same way, terror experts aren’t sure about the magnitude and timing of Al Qaeda’s next strike. But it would be myopic to shrug that because there’s uncertainty about the risks, we shouldn’t act vigorously to confront them — yet that’s our national policy toward climate change, and it’s a disgrace. Read The Big Melt by NICHOLAS D. KRISTOF, Published: August 16, 2007 in The New York Times. David Sibley's website has an excellent summary of bird mortality with a great graph showing the relative losses to different causes. Each of the factors contributing to bird mortality that he mentions was discussed, with specific suggestions about ways we can help, in 101 Ways to Help Birds, a book which has sold several orders of magnitude fewer copies than Sibley's extraordinary field guide. Oh, well. BirdLife International--Contributing factors sought as Red Knot population plummets. As usual I've been falling behind in my podcasts, but I've finally caught up, and have all the new programs I've produced in July and through today this month up. The list of programs is here. If you want the xml page for downloading the podcast, that's here. You can also find it in the iTunes store by searching for Laura Erickson. This month I'm trying to feature at least 10 of the 20 birds Audubon is listing in their declining common species list. So far I've done the Northern Bobwhite, Evening Grosbeak, and Northern Pintail. 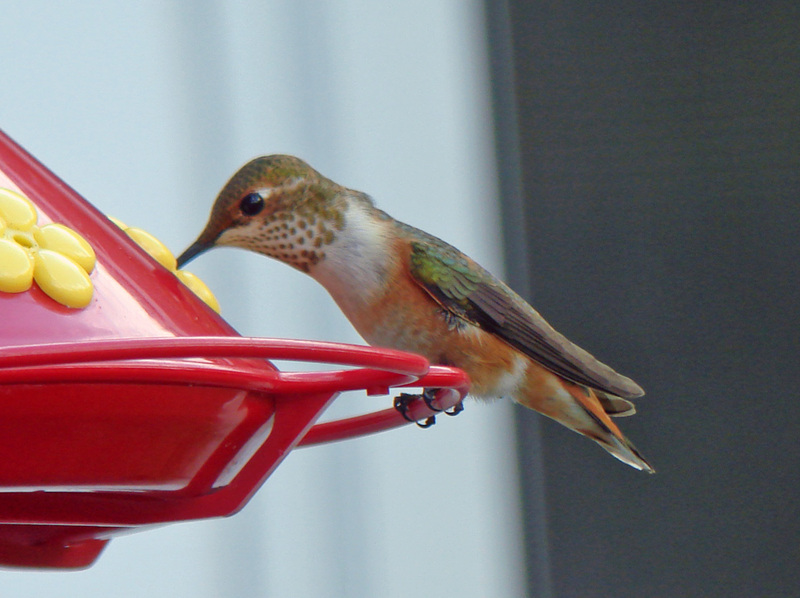 There are also programs about the Rufous Hummingbird I saw this weekend and about the downtown Duluth Peregrines. Check it out! Except for one year when I was getting grant money for program production, I've been writing, narrating, and producing "For the Birds" since 1986 as an unpaid volunteer. Too bad this is from 1994, the year BEFORE he started working at Halliburton. Or watch it on YouTube. 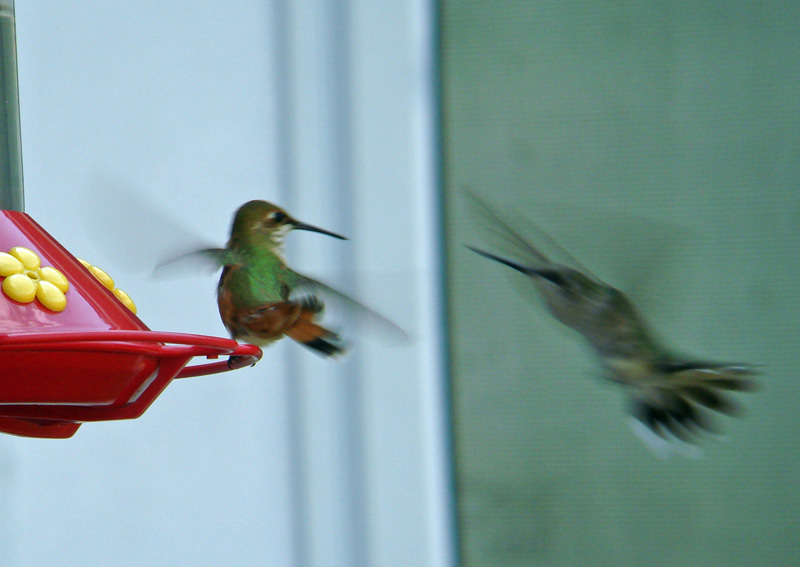 Look carefully at those hummingbirds! 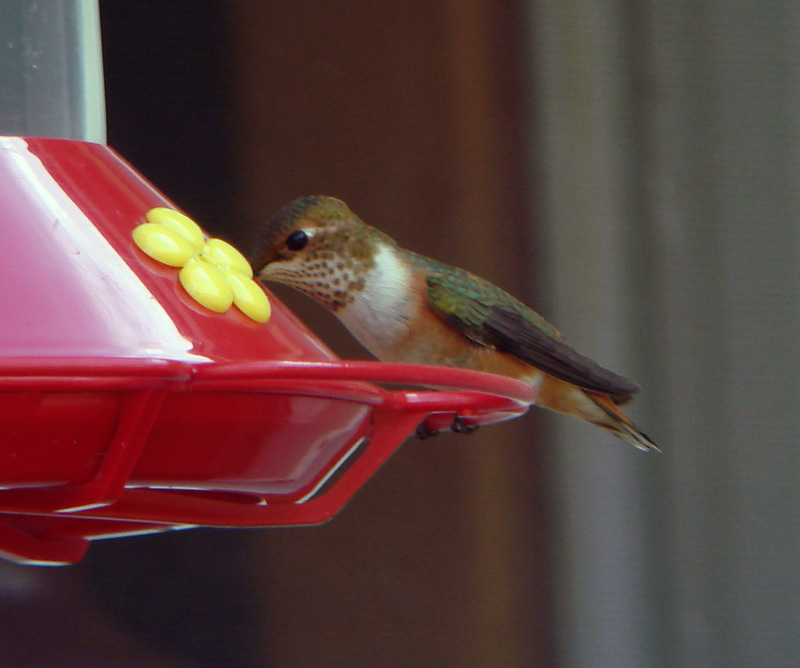 I got an email from some people who live out in the woods in northern Wisconsin who have an unusual hummingbird visiting their feeder. For now they prefer to remain anonymous. It belongs to Selasphorus and I'm virtually positive it's an immature male Rufous, but it's hard to say with 100% certainty that it's not Allen's. He appears to have too much rufous in the tail to be a Broad-tailed. He's a handsome little bird. I digiscoped these photos--he's skittish and not used to being gawked at by strangers, so birding pressure could well send him on his way. If you wish to see him, send me an email and I can put you in contact with the people. 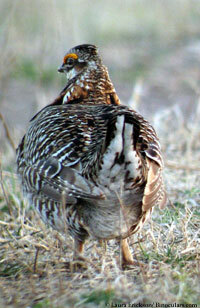 I've notified a prominent Douglas County birder who I know will respect the landowners' wishes. Hard as it is for some birders to believe, many non-birders, and even many birders, don't like the feeling of being invaded by hordes of listers. And under stressful conditions such as this drought, it's very important that we don't add further stresses to rare or even common birds. With this year's drought, pay close attention to your hummers--you never know what's wandering around desperate for food and water. 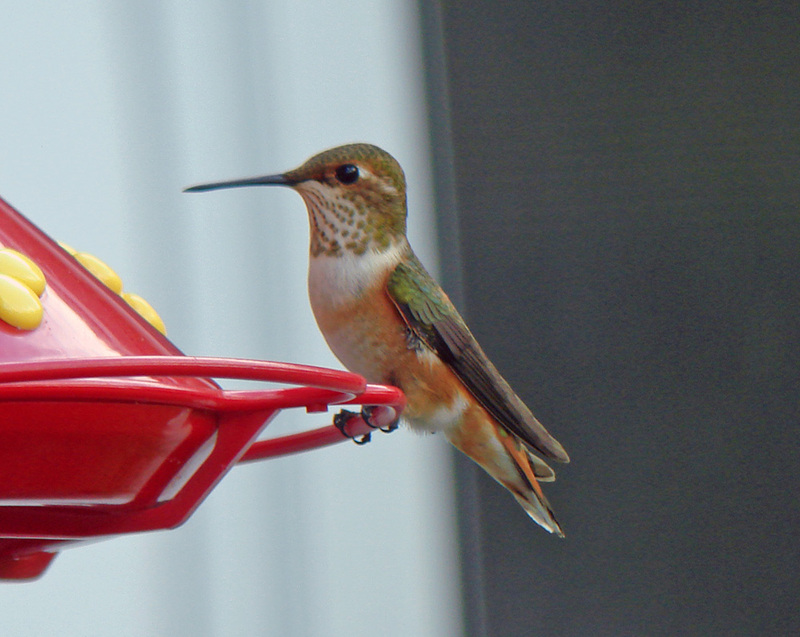 By the way, I've finally updated my Rufous Hummingbird photo gallery. It now includes these photos I took today, a few photos and a link to the rest of the photos I'd taken of my own November-December 2004 Rufous Hummingbird, and the photos I took in Mexico. Some of those, of an adult male, are especially nice. This spring I passed the 100,000 mark on my Toyota Prius. Russ keeps track of the mileage, and for the car's lifetime we've averaged slightly better than 50 mpg, darned good considering the cold associated with Duluth winters. In 2004, during the huge owl invasion, the car took lots of out-of-state birders here and there looking at our spectacular Great Gray Owls. Three Atlanta birders were along on a day when the temperature started out at 40 below zero and never did warm up much--we saw plenty of birds, and if the car wasn't quite toasty warm, we were comfortable and the windows didn't steam up. This past winter, while driving home from the Isabella Christmas Bird Count during an ice storm, a moose suddenly galumphed onto the road from the ditch. I barely had seconds to stop on the icy pavement but my trusty car managed the trick, and I sat in awe as the moose walked just a few feet beyond me, steam blowing out of its nostrils as it breathed, its legs millimeters from the front bumper. When I finally caught my breath from the near miss, I was thrilled at the close view--this was the closest I've ever been to a moose! This March, I had to go down to the Houston County Owl Festival in a blizzard, and because flights to La Crosse had been canceled, I had to pick up our keynote speaker at the Minneapolis Airport en route. The storm was bad enough that the Minneapolis Airport closed a few minutes after we left. But the car did just fine, even on the slippery, winding country roads to tiny Houston, Minnesota. 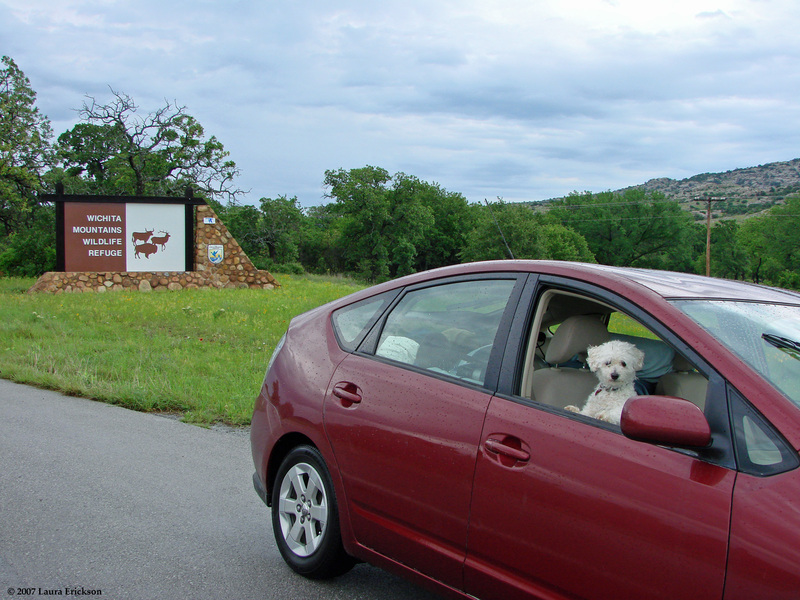 My Prius has taken me to the Cornell Laboratory of Ornithology in Ithaca, New York, to Merritt Island National Wildlife Refuge in Florida, the Wichita Mountains Wildlife Refuge in Oklahoma, Agassiz National Wildlife Refuge in western Minnesota, and the Cache River National Wildlife Refuge in Arkansas, as well as myriad other wonderful places. I've seen at least 300 species of birds on trips with this car. I feel guilty about how many miles I drive, but having a car that consistently gets better than 50 mpg makes me feel a lot better about it. We bought the extended warranty when we got the car in January, 2004. It's worked so beautifully that it's required ZERO work on all those miles, so we were actually refunded the $1500 we'd paid for the warranty. Our son Joe needs a car, and so this seems like the right time to drive down to Florida and "sell" him our Prius. So we're looking for a new one right now. I'm fixated on that gorgeous blue model. I badly want GPS because of all my traveling to unfamiliar places, and we don't want leather seats because our daughter is a vegan and anyway, leather is too sticky in summer and costs too much. So we have pretty specific desires as far as a replacement car goes, and since this is the end of the model year, we may be in for a long wait. But like a new baby, a perfect car is worth waiting for. And we're hardly suffering since we still have our trusty Holly Go-Lightly for the duration. The plastic bag is an icon of convenience culture, by some estimates the single most ubiquitous consumer item on Earth, numbering in the trillions. They're made from petroleum or natural gas with all the attendant environmental impacts of harvesting fossil fuels. One recent study found that the inks and colorants used on some bags contain lead, a toxin. Every year, Americans throw away some 100 billion plastic bags after they've been used to transport a prescription home from the drugstore or a quart of milk from the grocery store. It's equivalent to dumping nearly 12 million barrels of oil. Only 1 percent of plastic bags are recycled worldwide -- about 2 percent in the U.S. -- and the rest, when discarded, can persist for centuries. They can spend eternity in landfills, but that's not always the case. "They're so aerodynamic that even when they're properly disposed of in a trash can they can still blow away and become litter," says Mark Murray, executive director of Californians Against Waste. It's as litter that plastic bags have the most baleful effect. And we're not talking about your everyday eyesore. Once aloft, stray bags cartwheel down city streets, alight in trees, billow from fences like flags, clog storm drains, wash into rivers and bays and even end up in the ocean, washed out to sea. Bits of plastic bags have been found in the nests of albatrosses in the remote Midway Islands. Floating bags can look all too much like tasty jellyfish to hungry marine critters. According to the Blue Ocean Society for Marine Conservation, more than a million birds and 100,000 marine mammals and sea turtles die every year from eating or getting entangled in plastic. The conservation group estimates that 50 percent of all marine litter is some form of plastic. There are 46,000 pieces of plastic litter floating in every square mile of ocean, according to the United Nations Environment Programme. In the Northern Pacific Gyre, a great vortex of ocean currents, there's now a swirling mass of plastic trash about 1,000 miles off the coast of California, which spans an area that's twice the size of Texas, including fragments of plastic bags. There's six times as much plastic as biomass, including plankton and jellyfish, in the gyre. "It's an endless stream of incessant plastic particles everywhere you look," says Dr. Marcus Eriksen, director of education and research for the Algalita Marine Research Foundation, which studies plastics in the marine environment. "Fifty or 60 years ago, there was no plastic out there." Following the lead of countries like Ireland, Bangladesh, South Africa, Thailand and Taiwan, some U.S. cities are striking back against what they see as an expensive, wasteful and unnecessary mess. This year, San Francisco and Oakland outlawed the use of plastic bags in large grocery stores and pharmacies, permitting only paper bags with at least 40 percent recycled content or otherwise compostable bags. The bans have not taken effect yet, but already the city of Oakland is being sued by an association of plastic bag manufacturers calling itself the Coalition to Support Plastic Bag Recycling. Meanwhile, other communities across the country, including Santa Monica, Calif., New Haven, Conn., Annapolis, Md., and Portland, Ore., are considering taking drastic legislative action against the bags. In Ireland, a now 22-cent tax on plastic bags has slashed their use by more than 90 percent since 2002. In flood-prone Bangladesh, where plastic bags choked drainage systems, the bags have been banned since 2002. The problem with plastic bags isn't just where they end up, it's that they never seem to end. "All the plastic that has been made is still around in smaller and smaller pieces," says Stephanie Barger, executive director of the Earth Resource Foundation, which has undertaken a Campaign Against the Plastic Plague. Plastic doesn't biodegrade. That means unless they've been incinerated -- a noxious proposition -- every plastic bag you've ever used in your entire life, including all those bags that the newspaper arrives in on your doorstep, even on cloudless days when there isn't a sliver of a chance of rain, still exists in some form, even fragmented bits, and will exist long after you're dead. Read the whole article here. Paper bags, of course, aren't that much better. Although they break down much quicker, paper manufacturing also squanders natural resources and is a highly polluting process. Keep canvas bags in your car so you don't need to use either paper OR plastic when shopping. Rick Wright, the editor of Winging It, the newsletter of the American Birding Association, sent a comment for my previous post about anthropocentrism, with a link that Blogger doesn't make into a hotlink or post the entire URL to, so here it is--Winging It" "The Bilingual Birder." As I expected from an essay by Rick Wright, it's insightful and a good read! I don't read nearly as many blogs as I should--there are really a lot of great voices out there, and I'm finding blogs as good a source as any for finding out a lot of important news in the birding world. But yesterday I found my way to one of my favorite of all blogs, Mike McDowell's Birding and Digiscoping Blog. 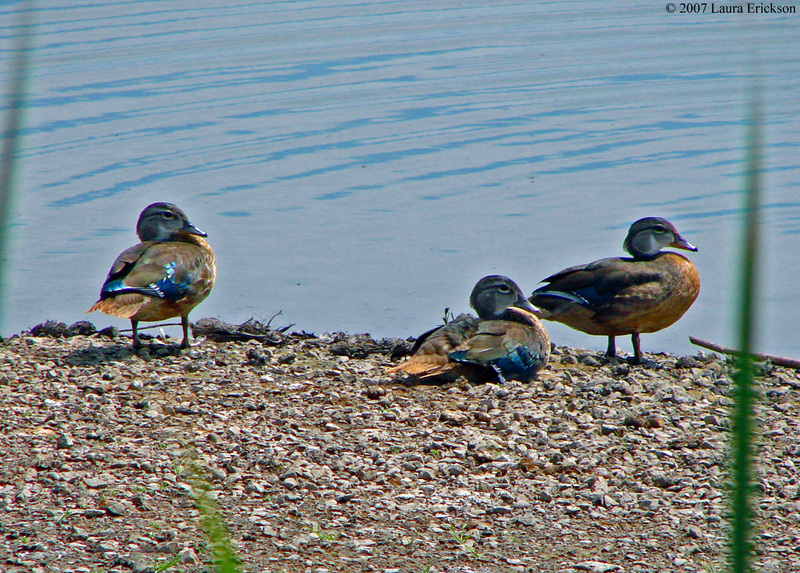 Mike is an amazing digiscoper--check out the gorgeous shorebird photos he posted this week! Wow, do I ever have the Chipping Sparrows in my backyard right now – the most I've observed in four years at our house. A few weeks ago the chattering of begging juveniles was nearly constant throughout the day. Fortunately, I haven't observed any of the adult sparrows bringing food to young cowbirds as I have in past years. Though I'll keep putting birdseed out for the chippies, they almost invariably fight over it - fluttering, grappling and ascending together in violent but remarkable bursts of energy and sound. Oh, it's probably not really the food per se but the fact they're in such close proximity to one another. Still, it's astonishing that such an otherwise sweet little bird is capable of such harsh behavior! Anthropocentrism is the name I use for the scientific error of putting humans in the center of the universe and thinking we are unique on the planet and in the universe in having intelligence, compassion, and other "human" traits. We share a huge amount of our genetic code and biochemistry with other animals. Pretending we're unique simply because we parade about in clothes and squander natural resources more voraciously and unnecessarily than any other animals is grossly unscientific. Thinking about this today, I also must acknowledge the fact that many people think we're superior in every possible way to animals because a very small percentage of us read and enjoy Shakespeare, many of us enjoy movies and plays, and a disturbingly large percentage of us follow news of Paris Hilton. No bird could create a Beethoven symphony, but then again, neither could any human except one. I think it's time to start calling people on unfair and unscientific accusations of anthropomorphism. So Barry Bonds broke Hank Aaron's long-standing home run record last night. I'm going to keep the asterisk next to Bonds's 756--that number is not as impressive as Aaron's 755, and is only meaningful in an era when one thing we hate way more than cheating is losing. I grew up in a different time--when Americans ridiculed the Communist Bloc Olympics teams for obviously using steroids. Americans whined about how unfair it was that our clean-cut American boys and girls, all amateurs in the true spirit of the Olympics, were competing against souped-up Communists paid by the state to perform. This was the era parodied by the Zucker Brothers in a Top Secret! scene wherein muscular men in drag posed as Communist bloc Olympic women athletes. I still get a laugh from older listeners when I talk about an incident when I had to feed a baby Saw-whet Owl some exceptionally large mice. I say they were huge--they looked more like rats than mice, like "the Russian shot-put team of mice." Kids today wouldn't get it. The asterisk next to Bonds's 756 will remain there for those of us who remember when as a society we almost uniformly disapproved of those who cheated in sports by using steroids, associating such cheating with totalitarian regimes who used athletics to "prove" the superiority of their system. I find it endlessly fascinating that even as more and more we resemble the totalitarian Russia of the 50s--in our red tape and bureaucracy with regard to health care, in our government spying on our citizens, in our citizenry's apathy and sense of helplessness about making a difference--we've also become like them in the use of steroids in sports. I'm keeping the asterisk next to Bonds's name, and will never forget that Hank Aaron was the one who scored the most home runs during the time that America really was a Democracy. But truth to tell, my personal Home Run King will always be Ernie Banks. Why? My feelings about the Chicago Cubs were summed up in this essay, written right after the Cubs lost to the Marlins in 2003. The wonderful and attentive Katty Geltmeyer, who has helped me a LOT with my Owls of Harry Potter pages, sent this review of Harry Potter: Order of the Phoenix (Movie 5) by the American Humane Society. Speaking of my Owls of Harry Potter pages, an interesting California-based magazine called Raspberry World reprinted my whole page in their current issue. That was a cool honor! Tragically, they give the online site as birderblog, so no one will be able to find me. As horrible as the I-35W collapse has been, it is disasters like this that separate the wheat from the chaff--that show the mettle of a man or woman. This story in today's New York Times had me crying. Among the dozens of wrenching accounts to come out of the collapse of the Interstate 35W bridge in Minneapolis, the actions of 20-year-old Jeremy Hernandez were a bright spot: Trapped in a tipping school bus with 50 children, he kicked open the back door and began helping them one by one to safety. Within a day, news outlets across the country were repeating the story of the school bus, along with a sad footnote — that Mr. Hernandez had recently been forced to drop out of an automotive repair program because he could not afford the $15,000 tuition. Mr. Hernandez was not available to comment on the offer; Ms. Schwartz said he left town for northern Minnesota late on Friday, overwhelmed by the attention and concerned that his co-workers were being overlooked. He spent the weekend fishing. When President Bush’s staff contacted him to request a photo opportunity, “He was just, like, ‘Nope,’ ” she said. Read the whole wonderful story. I love subscribing to the online New York Times. The Simpson's Movie: Beaks UP! Oh my gosh! The Simpsons Movie was wonderful! And it had two hilarious scenes with birds--one noting that birds tend to crash into glass and one that was a homage to Disney movies--or at least a parody of them. I'm a Simpsons fan to begin with, but I think anyone with a sense of humor would enjoy it, even if we don't like the idea of swallows crashing into windows. Thursday I went down to the Twin Cities to spend some time with my Journey North buddy Jane. We'd made these plans over a week ago, and I decided to go through with it even after the horrible collapse of the I-35W bridge. Traffic wasn't nearly as bad as I'd expected, though it took almost 4 hours to get to Jane's--I usually go over the bridge, so had to take an alternate route. Jane and I needed some down time, so she and I decided to just do what we felt like, so we went out to lunch and then to Garrison Keillor's book store, Common Good Books, in St. Paul. What a lovely little place--just like my fantasy perfect bookstore! Well, except for one little thing--my fantasy bookstore would carry my books. I checked out the nature section and then Jane asked at the desk but they hadn't heard of me. Oh, well--it wasn't that disappointing, and then we headed to the movies to see Hairspray--there wasn't a single bird in the film, but it was a joyous riot. I just love Christopher Walken when he gets into dancin' mode. Then yesterday I met up with my friend Julie Brophy. She and I are going to be working on a project next year trying to attract nighthawks to nest on rooftops by providing nest pads, and we were making some plans for the project over lunch. Then we headed to Purgatory Creek to see what we could see. Neither of us had been there before, and we had no clue where the blind was (must be a pretty effective one!) so we missed the Red-necked Phalaropes that had been hanging out there. We did see several species of shorebirds including one Buff-breasted Sandpiper, and lots of egrets. A family with a couple of little kids came by and Julie helped them see some of the birds. But despite the nice variety of birds and the fun of seeing children enjoying them, the low water levels filled with dying, struggling fish made me sad. I drove home feeling low, listening to news of deaths in Iraq, deaths in the Mississippi, crumbling infrastructure and droughts and hot temperatures, and wondering what we can do to turn things around. Where's Franklin Roosevelt when we need him? Just think--while he was president, we defeated BOTH the Japanese and the Nazis in less than four years while ending the Great Depression and keeping our country as united in purpose as it's ever been since the Revolution. I think the secret of Roosevelt's success was his reminder that the only thing we have to fear is fear itself. It's rather the opposite approach to our current color-coded fear-mongering, keeping everyone on high alert about Iraq even as we make arrangements to provide weapons to Saudi Arabia, the very country that supplied almost all the hijackers on 9/11. I find it all very confusing and demoralizing, but as I said, pessimism and fear are not the way to pull ourselves out of this morass. It's important to pay attention to the loveliness in our midst so we stay anchored to the best of our world. I don't think it's a coincidence that Franklin Delano Roosevelt, who so believed in and affirmed human dignity and and value of each human being, was also an avid birder--he knew what was worth protecting and saving, and why. We need to be more proactive--about our aging infrastructure, the quality of our air and water, and disappearing natural habitats. The egret was the bird the National Audubon Society has long used as its emblem, since Audubon got its start in the band of people working hard to stop the slaughter of birds for their beautiful plumes. 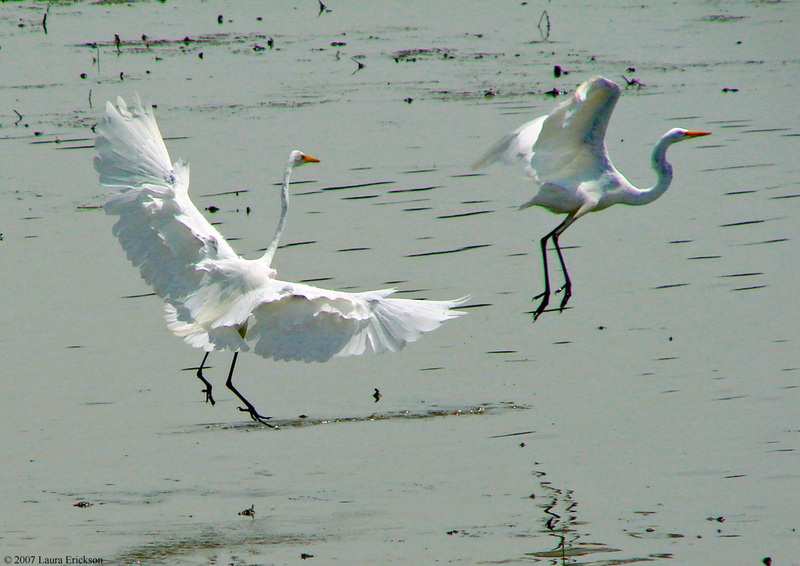 But the egret serves equally well as an emblem for clean air and water, and protecting wetlands and other habitats. I saw an egret flying overhead during television coverage of the I-35W bridge, threading its way through the scene as if knowing that the fates of every creature on earth are inextricably stitched to our survival. Collapsing buildings and bridges, exploding pipes, bombs and automatic weapons and land mines--all of these bode ill for birds as well as us humans. Roosevelt would have understood. Earlier this week I posted a photo from The Daily Mail: "Fake 'bird-scaring' owl becomes home for family of swallows." 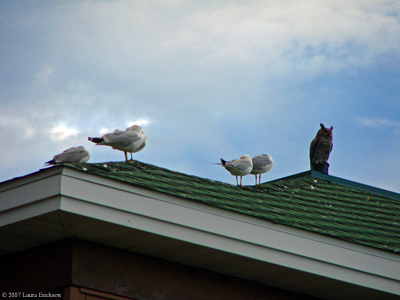 To reinforce the lesson the plastic owls aren't particularly scary to birds, Richard Hollis, a birder from Iowa, sent the above photo of pigeons ignoring a plastic owl. And on the Fourth of July, I took this photo of Ring-billed Gulls ignoring this plastic owl in Duluth. 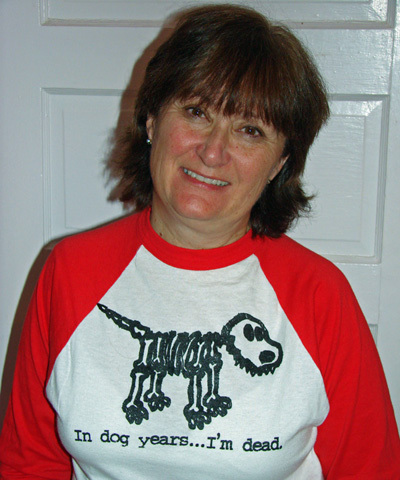 I was interviewed this morning on WEEU's "Jack's Backyard" program. It airs in Reading, PA. But what a humbling experience! Jack Holcomb had actually read 101 Ways to Help Birds, and apparently genuinely loves it for its breadth and scope as well as the depth of information--he actually read the Table of Contents on air! He said this belongs on the shelf next to his birding "bible," Roger Tory Peterson's field guide. I was genuinely honored. I've been having a rough summer with more problems than I quite know how to deal with. This was such a refreshing and unexpected accolade that my head is still spinning. Instead of consuming four billion gallons of water a year in individual-sized bottles, we need to start thinking about what all those bottles are doing to the planet’s health. Here are the hard, dry facts: Yes, drinking water is a good thing, far better than buying soft drinks, or liquid candy, as nutritionists like to call it. And almost all municipal water in America is so good that nobody needs to import a single bottle from Italy or France or the Fiji Islands. Meanwhile, if you choose to get your recommended eight glasses a day from bottled water, you could spend up to $1,400 annually. The same amount of tap water would cost about 49 cents. Next, there’s the environment. 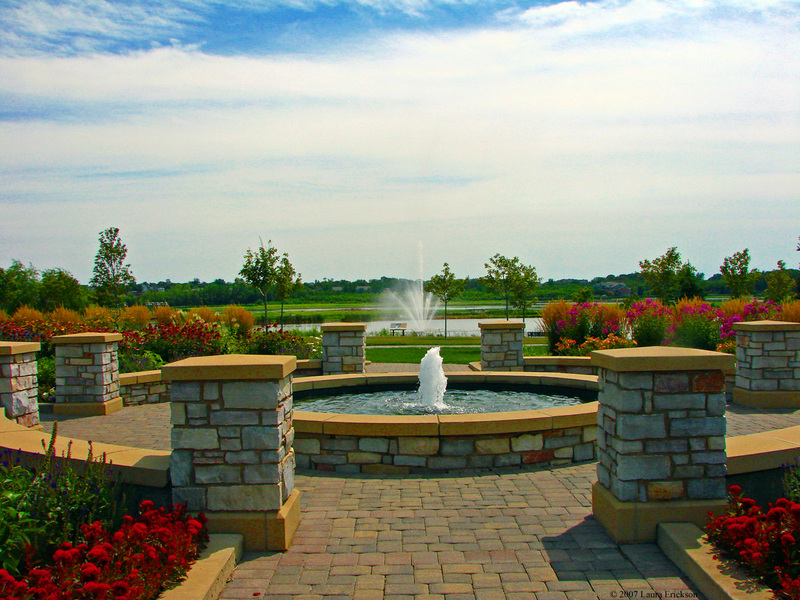 Water bottles, like other containers, are made from natural gas and petroleum. The Earth Policy Institute in Washington has estimated that it takes about 1.5 million barrels of oil to make the water bottles Americans use each year. That could fuel 100,000 cars a year instead. And, only about 23 percent of those bottles are recycled, in part because water bottles are often not included in local redemption plans that accept beer and soda cans. Add in the substantial amount of fuel used in transporting water, which is extremely heavy, and the impact on the environment is anything but refreshing. Tap water may now be the equal of bottled water, but that could change. The more the wealthy opt out of drinking tap water, the less political support there will be for investing in maintaining America’s public water supply. That would be a serious loss. Access to cheap, clean water is basic to the nation’s health.